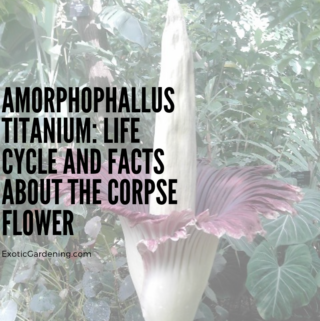 This post is courtesy of The Netherlands Flower Bulb Information Center. 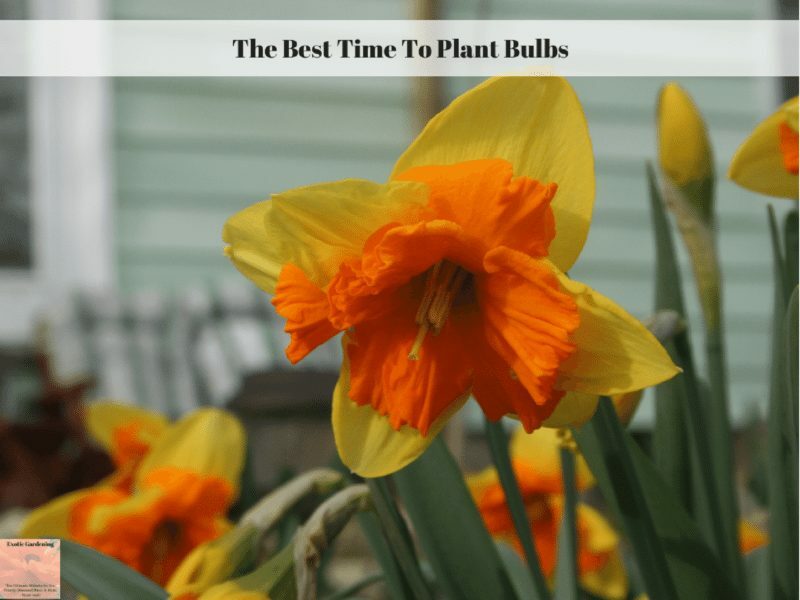 The best time to plant bulbs varies by a few weeks according to what bulb planting region you live in. Below are the regions as well as a few tips for fall planting, courtesy of the Netherlands Flower Bulb Information Center. Plant bulbs when the night time temperatures are between 40-50 degrees F, making sure that this is done at least six weeks before freezing to allow the bulbs to begin to root. Water your bulbs thoroughly after you plant them and apply a slow release fertilizer to the soil that is specifically designed for bulbs. Do not put the fertilizer in the same hole as the bulb. This can cause the tender roots of the bulb to burn. Once the ground has frozen you can mulch your bulbs with a lightweight mulch such as pine needles, straw or chopped up leaves. 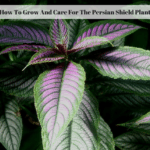 Perennials are plants that over-winter in the garden and will come back the following year. Perennials also multiply over time. Skillful combinations of bulbs and perennials can be quite dramatic. “In the last decade, American gardeners have become increasingly sophisticated in their uses of perennials in the garden,” says Frans Roozen, technical director of theInternationalFlowerBulbCenterin Hillegom,Holland. 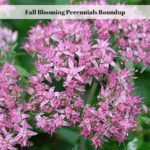 “Fall planting gives perennials a leg up on the next season. If they’re fully rooted in fall before winter season snows or rains, come spring, they’re fully established and ready to grow. 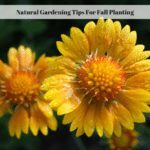 With fall planting, everything happens faster and plants acquire extra strength. Many of you know that you should plant your bulbs in the fall, but did you know that there were sixteen different U.S. Bulb planting regions? 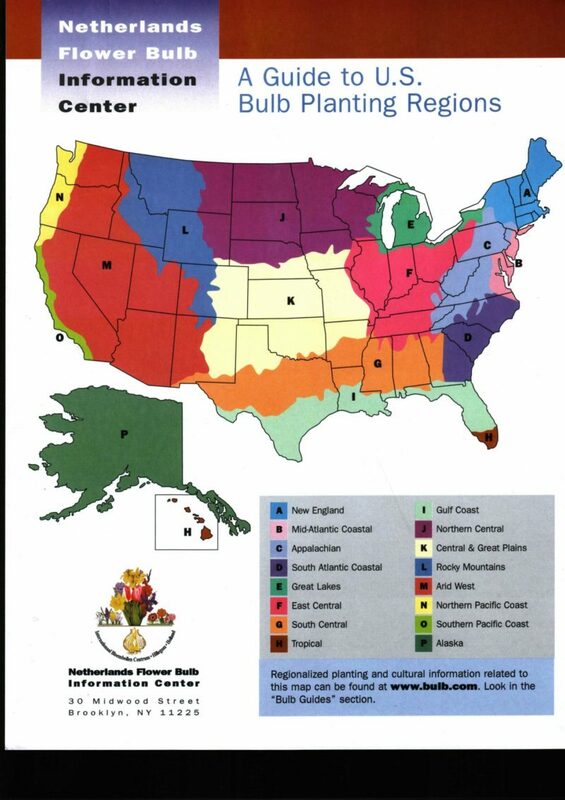 These regions greatly affect your choices in bulbs and proper planting times. The reason for this is that it is important to take into consideration such things as climate, elevation, average rainfall as well as other various seasonal weather patterns. This information will help you to achieve the maximum success possible with your bulbs. The conditions here are almost perfect for spring-flowering bulbs. 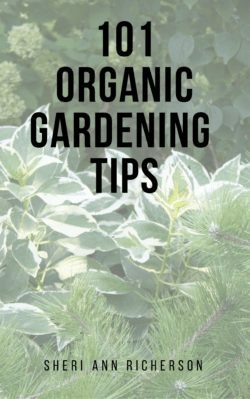 If you would like to try to grow something that is not hardy to your area, you can try these tips. Although success is not guaranteed, you just might be surprised at the outcome. Choose a site that is well protected from wind and extreme cold and mulch your bulbs heavily. Plant the bulb deeper than you would if it was in it’s natural environment. A good place to try this is up against a foundation or another equally protected spot. The optimum planting time for this region is September 15th through November 15th. Bulbs that will naturalize well in this area include Scilla siberica, Narcissus poeticus var. recurvus, Tulipa clusiana ‘Cynthia,’ Allium moly, Eranthis cilicica, Galanthus nivalis, Colchicum byzantinum and Crocus tommasinianus. For those of you who like marginally hardy or tropical plants this would be an area to try them as long as they are planted in an area that is protected from wind and extreme cold. You can also put some straw or a light mulch of pine needles around the foliage that begins to emerge early to help protect it from burn. 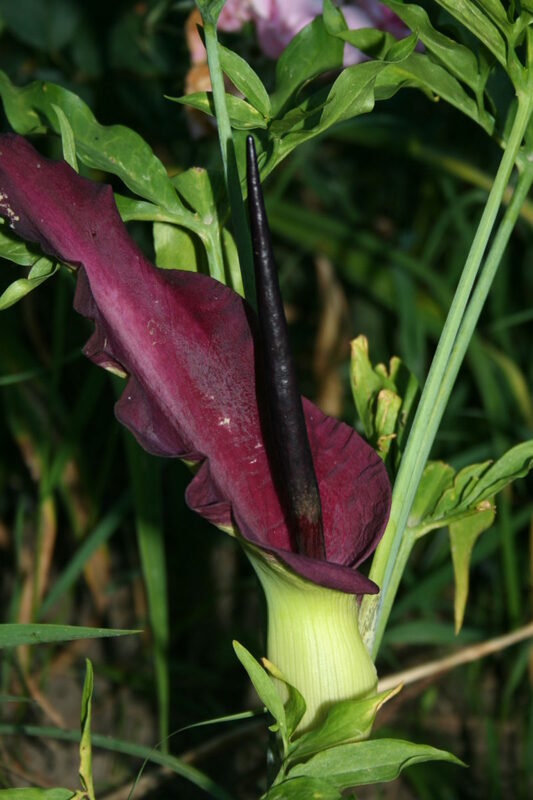 However, even if it does get slightly burned, it will not affect the flowering. The optimum planting time for this region is October 1st through November 30th. Good choices for bulbs that will naturalize easily in this area include Narcissus bulbocodium conspicuus, Narcissus obvallaris, Tulipa clusiana var. chrysantha, Chionodoxa forbesii, Hyacinthoides hispanicus, Ipheion uniflorum and Ornithogalum nutans. 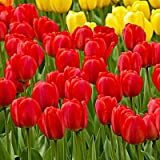 50 Red Oxford Tulip Bulbs - Tulipa Darwin Hybrid: Super-Sized X-tra Value Bag!! Due to the variety of elevations in your region, you have many opportunities for different planting styles. The hills and banks in this area make perfect spots for creative designs. The optimum planting time in this region is September 15th through November 30th. Bulbs that naturalize well here include Chionodoxa sardensis, Crocus ancyrensis ‘Golden Bunch,’ Erthronium dens-canis (in woodland areas), Fritillaria meleagris (in damp meadow areas), Geranium tuberosum, Hyacinthoides hispanica and Scilla bifolia. The climate here is moderate with hot, moist summers and cool or cold, moist winters. This gives you the opportunity to grow many spring-flowering bulbs successfully. The only drawback being that due to the moist conditions, many bulbs will not perennialize well. If this is your goal, check with local gardening centers for their advice. If you have an automatic irrigation system, plant your bulbs will they will remain relatively dry. The optimum planting time for this zone is October 15th through December 15th. Bulbs that will easily naturalize here include Narcissus bulbocodium (in the lawn), Narcissus jonquilla (perfect for hot summers), Tulipa saxatilis, Allium sphaerocephalon, Arum italicum (shade), Chionodoxa forbesii, Crocus tommasinianus and Ipheion uniflorum (in the lawn). Given the fact that this region is greatly affected by the extreme climate changes and heavy winds from theGreat Lakes, choosing shorter, sturdier cultivars that can stand up to these conditions may be more appropriate. The optimum planting time for this zone is September 15th through November 15th. Bulbs that will easily naturalize here include Allium triquetrum (in woodland areas), Crocus tommasinianus ‘Ruby Giant,’ Eranthis cilicica (damp, woodland areas), Erythronium (woodland areas), Leucojum aestivum (at a streams edge), Scilla siberica (in woodland areas or lawns) and Triteleia ‘Queen Fabiola’ (dry, meadow areas). This is an excellent area for most spring-flowering bulbs because of the moderately cold winters, ample moisture and the warm to hot summers. The optimum planting time for this region is October 1st to November 30th. Bulbs that naturalize here are Allium roseum, Anemone nemorosa (woodland area), Chionodoxa forbesii, Crocus sieberi ‘Firefly,’ Crocus tommasinianus, Geranium tuberosum, Hyancinthoides hispanica and Nectaroscordum siculum. Although your climate will allow most spring-flowering bulbs to flourish, the bulbs that have longer cold requirements and a drier summer dormancy period will not. On occasion some tropical, semi-tender bulbs will naturalize in this climate. This is also an area where many heirloom bulbs are found in old homes and cemeteries. Bulbs that will naturalize here include Narcissus jonquilla, Tulipa clusiana ‘Cynthia,’ Tulipa saxatilis, Allium neapolitanum, Allium sphaerocephalon, Dracunculus vulgaris, Muscari neglectum and Triteleia laxa ‘Queen Fabiola’. Although this climate rarely gets frost, it does have very hot and humid summers. This is an ideal climate for many summer-blooming tropical bulbs but is not such a great environment for more traditional spring-flowering bulbs such as the tulip. If you really must have tulips or other spring-blooming bulbs that won’t thrive in your climate you can buy them yearly from a local garden center or try over-wintering them in your refrigerator to give them a proper chill and then try forcing them. This is a good zone for using raised beds to help improve drainage after the summer storms. The optimum planting time for bulbs in this region is December 1st through January 31st. This is another region that is great for summer blooming bulbs, however, it also is a fine area for many spring-blooming bulbs too as long as they are carefully chosen. Daffodils and other narcissi will thrive here. The optimum planting time for this region is October 1st to December 31st. The biggest challenge this region faces is the moisture level. To help offset this problem a bit of extra water in the event of a dry autumn may help the rooting process. Also, in the event of no snow, add an extra layer of mulch to the top of the bulbs to help keep them cool. The optimum planting time for this region is September 15th to November 1st. Bulbs that naturalize well in this region include Narcissus poeticus var. recurvus, Tulipa clusiana chrysantha, Allium flavum, Allium oreophilum, Eremurus stenophyllus, Muscari azureum and Scilla siberica. This region allows for a wide variety of hardy spring-flowering bulbs. 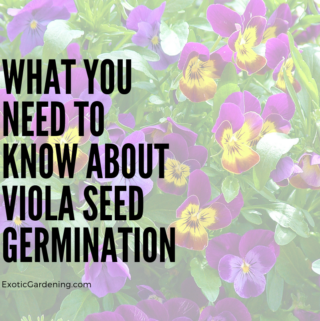 However, you will need to plant them in areas with less wind and extreme cold exposure to help extend the blooming season. 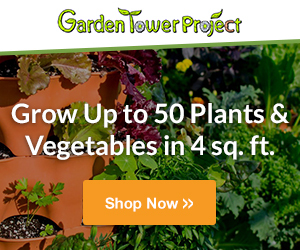 Doing this will also help to protect early spring or late fall bloomers from the extreme temperature fluctuations. In the event of a dry spring, water weekly as long as the foliage is green. The optimum planting time for this region is September 30th to November 30th. 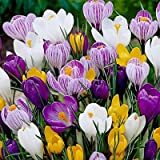 Bulbs to choose for naturalizing in this region include Tulipa tarda, allium caeruleum, Chionodoxa forbesii (for shady areas), Crocus tommasinianus, Dichelostemma congestum, Eremurus stenophyllus, Ixiolirion tataricum and Muscari armeniacum. This is largely an alpine environment that makes it excellent for hardy spring-flowering bulbs. Bulbs that naturalize well in this area include Narcissus peoticus var. recurvus, Tulipa tarda, Allium caeruleum, Allium Flavum, Allium neapolitanum, Camassia leichtlinii, Eremurus stenophyllus and Erythronium. This region is good for growing many bulbs, especially those native to dry climates. However, this is a very diverse region and your specific climatic conditions must be taken into consideration. Some of these major factors include high-mountain altitude, low-desert heat and sheltered valley basins. 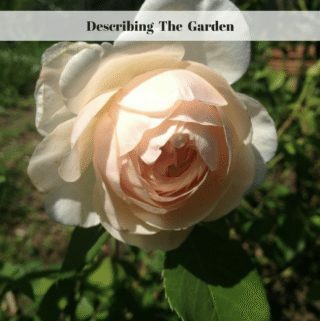 Because of the numerous pockets of extreme climate variance, you may want to supplement the information here with a reference book such as the Sunset Publication’s Western Garden Book or you can visit their website. The best planting time for this region is September 30th through November 30th. Some suggested bulbs for naturalizing include Allium neapolitanum, Allium uniflorum, Eremurus, Fritillaria purdyi, Triteleia hyancinthis and Ipheion. This is a perfect region for many spring-flowering bulbs. This region is the closest we come in theU.S.to the English countryside climate. Suggestions for ordering bulbs for people in this climate include writing a letter with your order explaining that you would like your bulbs sent at a specific time. This will help to avoid your bulbs arriving after the heavy rains have begun. The optimum planting time for this zone is October 1st through December 1st. Bulbs that will naturalize in this area include Anemone ranunculoides, Arum italicum, Calochortus ‘Golden Orb,’ Dichelostemma ‘Pink Diamond,’ Eranthis cilicica, Galanthus nivalis ‘Viridi-apice,’ Hermodactylus and Nectaroscordum siculum. Few gardeners realize that this is a great area for flower bulbs. Try bulbs such as trumpet daffodils, dwarf narcissi and iris. Tulips that usually do well in this climate include single lates, double lates, lily-flowered and some of the species types. There are two major fall planting seasons for this climate. For bulbs that are native to the Mediterranean area or other similar climates, plant anywhere from mid-August (or sooner if available) to December. Dutch bulbs should be planted anywhere from mid-October through late January. There are quite a few bulbs that will naturalize in this climate. Some of these include Allium sphaerocephalon, Spanish bluebells, Scilla peruviana, Oxalis purpurea, Bearded Iris, Paperwhite narcissi, Freesia, Watsonia, Sparaxis, Tritonia, Leucojum aestivum and Ixia. This area is very large and variable with a very short growing season. Being creative in this region can help many bulbs to thrive. The best planting time is from September 15th through October 15th. Bulbs that will naturalize here include Allium moly, Allium oreophilum, Camassia leichtlinii, Chionodoxa forbesii, Crocus tommasinianus, Fritillaria camschantcensis, Galanthus elwesii and Narcissus poeticuc var. recurvus.